Thanks to those of you who joined us in Boston for USENIX '08. Check out the online proceedings and available slides of the invited talks here. Video of the invited talks are also available here. Save the date for USENIX '09. Join us in San Diego, CA, June 1419, 2009, for the 2009 USENIX Annual Technical Conference. The program co-chairs will be Geoffrey M. Voelker, University of California, San Diego, and Alec Wolman, Microsoft Research. Interested in participating in USENIX '09? Check out the Call for Papers! The USENIX Lifetime Achievement Award ("The Flame") and the Software Tools User Group (STUG) Award were presented at USENIX '08. Andrew S. Tanenbaum won the 2008 Flame Award for his many contributions to systems design and to openness both in discussion and in source. Bryan M. Cantrill, Michael W. Shapiro, and Adam H. Leventhal, the DTrace Three, won the 2008 STUG Award. 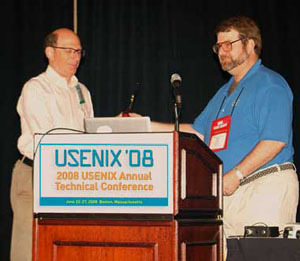 Andrew S. Tanenbaum receiving the Flame award from USENIX Board President Clem Cole at USENIX '08. 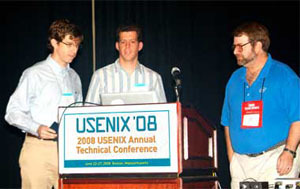 Bryan Cantrill (left) and Adam Leventhal (center) receive the 2008 STUG Award from USENIX Board President Clem Cole (right) at USENIX '08. Xen Summit North America 2008 took place June 2324, 2008, and the First USENIX Workshop on Large-Scale Computing (LASCO '08) took place on June 23, 2008. Both events were co-located with USENIX '08.